When We Go, Where We GoProfessor Marc Conner of the English Department leads a Spring Term Abroad to Ireland every other year. The first trip was in the Spring of 2000, when 12 W&L students participated in the six-week program. The second trip was in the Spring of 2002, also with 12 students. The program is primarily designed for English majors, although non-majors have participated and are quite welcome, if space permits. We spend the first four weeks in the west of Ireland, based in Tralee, Co. Kerry. Each week we make two day-trips to various sites and important landscapes throughout the southwest and west of Ireland, including several overnight trips. We also study a range of works of Irish literature and history, as well as receive instruction in basic Irish (ultimately translating several medieval Irish ballads and poems). While in the west, we use the facilities of the Irish College of the Humanities, an outstanding Irish institute that offers classroom space, dormitory space, computer facilities, and instruction to American colleges abroad. The College's director, Professor Michael Kissane, also serves as our principal guide on all of our tours and site visits. The last two weeks of the term we spend in Dublin, the capital of Ireland, in hostels or efficiency apartments located in the middle of the city. 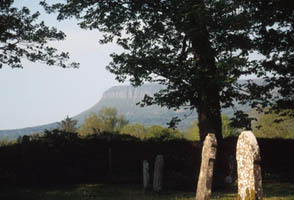 Here too we take several day-trips to numerous sites that are prominent in Irish literature, history, and even myth. What We Read, What We SeeReadings are closely coordinated with the site visits, so that we study Yeats's poems and tour his famous Tower, Thoor Ballylee; we read Synge's Aran Islands and then go on an overnight stay to Inishmoor, the largest of the islands; we read the Blasket Island Storytellers, then visit the Blaskets; we study Joyce's Dubliners and A Portrait of the Artist and then tour the numerous Dublin sites associated with these writings. In addition, we examine sites linked to Irish antiquity such as the Hill of Tara; sites from medieval Irish history such as the High Crosses at Clonmacnois or the Rock of Cashel; and a wide range of Irish castles, monasteries, abbeys, and landscapes. The links below offer more detailed information on the program. Explore these at your leisure, particularly the Spring Travel Log from 2000, which gives a pictorial and narrative "diary" of all the sites explored by the 2000 Irish Bunch, and the Spring Travel Gallery from 2002, which offers a complete itinerary and slide-show of the 2002 trip. Questions may be directed to Marc Conner at connerm@wlu.edu.